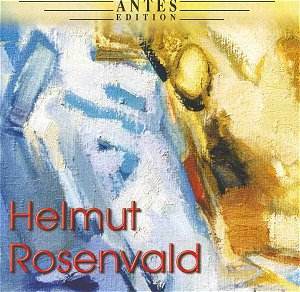 Rosenvald is an Estonian composer who studied composition with Vilem Kapp in Tallinn. For more than thirty years (1961-1989) he played as a member of the Estonian National Symphony Orchestra. He declares Sibelius, Shostakovich and Tubin as his influences. Shostakovich and Schnittke, especially the latter, are certainly to the fore in the scathing scar tissue of the First Violin Concerto. The Second Concerto, from ten years later, is made of more yielding stuff with a light-suffused first movement. While the First Concerto might sometimes be heard as a sort of amalgam of late Frank Bridge (Third Quartet) and Kurt Weill (Violin Concerto), the Second Concerto mixes the edgy angular vitality of Britten (violin concerto) at the centre with the flanking humanity of Rubbra (Improvisation and Violin Concerto) and Finzi (Introit). The Two Pastorals are by no means facile pieces and certainly are not Finzian �ruralia�. There is a chill in this music and a subtle injection of dissonance. The three movement Sonata takes us from the luxury of full orchestra to the spareness of Gont�arova's solo violin. The writing is brusque with energy, tough and, in the third and final movement, alive with a virtuosity that is part peripatetic fiddler and part Bartók. The Sonata would pair well with the two Frankel solo sonatas. The Third Symphony boils with the sort of apocalyptic energy found in William Alwyn's Fourth Symphony but without the grunt and Holstian weight of that work. A closer parallel might be Stanley Bate's still unrecorded Third Symphony although that dates from 1940. Interesting to see that the composer Jan Rääts was the Estonian Radio tonmeister for the Symphony. The Symphony enthrals with vigorous driving music at 4.20 and mutates into a neo-RVW pastoralism at 4.56. This is highly inventive stuff instinct with unease. Anxiety imbues these pages and even the lulling of the andante mosso is overhung and ends with threatening col legno clattering. The finale launches with more energy reminiscent of Mossolov's Iron Foundry but with counterpoint lines laid out with greater transparency. The writing at 4.43 onwards has an impressively calming equilibrium and the quiet chordal punctuation of the last few pages is outstandingly impressive. The Nocturne is from a year after the Symphony. It too is restful - a little like the warmly pastoral moments in Schoeck's Sommernacht but with an expressionistic overlay typical of Schrecker or Zemlinsky. This could easily be as much of a signature piece for Rosenvald as Schnittke's Spiegel im spiegel or the middle movement of the Glass Violin Concerto. A modernistic Pachelbel's canon. Rosenvald's worklist includes nine symphonies, several sinfoniettas, a Classical Symphony for strings and timps, six string quartets and chamber works for violin and cello. Let's hear them. Antes and Bella Musica (alongside Eres and Edition 49) are doing wonders for Estonian music. Long may this continue. This one is well worth getting if you enjoy Tubin, Schnittke, Alwyn, Rubbra or Britten. Recommended if the allusions reflect your tastes.